Does NOT include games, RF adapter. Some packages may be more expensive and include games. Released September 9th, 1999 (advertised as 9/9/99) this was the machine to own that Christmas. When the Playstation 2 was impossible to find in Christmas of 2000, it was the machine to get. Unfortunately nobody did. That's why it's $50 now. At this point I'm afraid the Dreamcast is a case of too little, too late. No new games are being produced so unless you have the patience to hunt down the truly excellent titles for this little gem it will not be worth your while. Like the XBox and Game Cube there are 4 controller ports on the front for multi-player gaming. Like the Game Cube it also requires memory cards to save your games. Additional devices include a keyboard (hey, how else are you going to taunt everyone else online?) a mouse, a variety of steering wheels and the oddest of extras, fishing and maraca controllers. The graphics on the Dreamcast are quite good and many of the later games easily surpass all but the most recent Game Cube, Playstation 2 and XBox titles. It's a wonder why people passed it up during the first year of release in favor of the inferior Playstation One and Nintendo 64. Granted at the time the Dreamcast was $199 and not $50. Everyone should own one for $50. $50? How could you not buy this for $50? Pick up 3 extra controllers and some VMU's (Virtual Memory Units) and you're good to go. But you better act quickly. 2001 was the last year for the Dreamcast and if you go "Oh, I'll get that later..." chances are you will not see it later. The Dreamcast specialized in fairly unique games, as I've said it's the only machine capable, out of the box, of going right online. Look for Phantasy Star Online for a decent action adventure game where you gain experience and weapons the longer you play. Go online and play with other folks. Be aware there are 2 versions of this game and the second version charges an added fee for online play. You can get a more traditional role playing style game in Skies of Arcadia. Meanwhile Jet Grind Radio created an entirely new genre (roller-blading graphitti game.) If racing is more your style then you owe it to yourself to find a copy of Metropolis Street Racer. This game was recently brought back to life on the XBox under the name Project Gotham Racing. The best fighting game for any home system is also an exclusive to the Dreamcast. Make sure you play Soul Calibur as it's a real showcase title. Of course there's also Bomberman Online, one of the most addictive games ever invented. Using extra software from a company called Bleem! you can also play 3 older Playstation One games on your Dreamcast with upgraded graphics. The games are Gran Turisimo 2, Tekken 3 and Metal Gear Solid. Bleem! however recently closed operations so if you can find the 3 Bleem! discs you should buy them ASAP. Well, it's a dead system. Sega announced back in late January, 2001 that they were only going to support it through March, 2002. As it turned out they BARELY supported it through the end of September 2001 and cancelled some of the last, most highly anticipated games. If you can find a lot of good games very cheap then absolutely, it's worth every penny of the $50. If you can't find any games you want then it's not. But then that goes for any console, regardless of the success. Then there's the matter of the online fee. If you purchase the last few sports games Sega wants to charge you a monthly fee to be able to play against other people. The last version of Phantasy Star Online has a similar (but completely separate from the sports games) fee structure. The older online games do not charge you anything extra for game access however. As of this writing, the Christmas season of 2002, the point is moot. Finding a Dreamcast is all but impossible unless you go to game specialty stores and even then it's going to be a used unit. 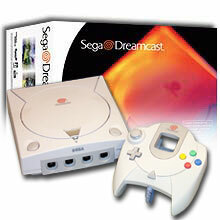 The time for the Dreamcast is past and it's included here as a courtesy because it was the first machine released in this generation of hardware.